10-1/4", Pre-Seasoned, Cast Iron, Combination Deep Skillet & Shallow Skillet/Griddle With Lid. Such a simple thing...but so great! I purchased this combo cooker to start my cast iron collection because of the variety of ways it can be used. I have no previous experience with cast iron, so I am reading everything I can on the subject. I made a hashbrown, egg, bacon breakfast casserole in it this morning and was very pleased with the process and end result. I used both the lid and the pot to brown the bacon (to further season my new items.) The cast iron heated up quickly on the stove top using only medium heat. There was no need to raise the temp higher on my stove. Then I put all the ingredients together in a 350 degree oven and let it cook for about a half hour. Great results. Steaming hot, crispy on the top, sides, and bottom. No hot spots. The best part was clean up. It needed minimal scrubbing with hot water, then I sprayed on Pam while it was still warm. That's it. And the surface is now MUCH smoother than it was when I first opened the box a couple days ago. No more stickiness either. I chose this greasy recipe because I figured it would do the best job at furthering the seasoning process. Love it, love it, love it, and I can't wait to try more recipes. I also purchased the reversible gridle and a camp dutch oven. Can't wait to experiment with those items too. This is a great basic all-in-one pan. Excellent for small kitchens and for those getting their first pieces of cookware. This is also known as a Marmitout in France and is often gifted to newly weds or kids moving out on their own. The top pan is a deep skillet and the bottom is Lodge's chicken fryer which is deeper than a skillet but shorter than their dutch ovens. These two pieces combined give you 3 basic pieces of cookware: a dutch oven, skillet and saucepan. This will be the most often used pot and the first one many reach for. Although both pieces are preseasoned, you will still need to cook in it 10x or so to get it perfectly seasoned. The best (and quickest) way to do this is to fry something in each one. The only downside to this and all cast iron when gifted to college kids is that someone will invariably soak it in the sink, stick it in the dishwasher and/or otherwise ruin the seasoning. 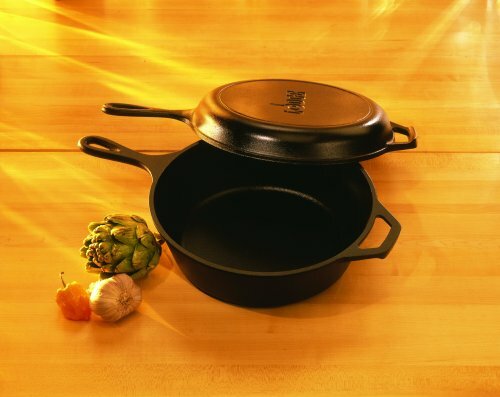 However, Lodge's price of $40 is less than 1/3 of Le Creuset's porcelain-enameled cast iron Marimitout, and the coating doesn't chip or scratch off with normal use. Perhaps this is the ultimate gift in more ways than one. Overall an excellent workhorse and with a little attention and care a valuable addition to anyone's kitchen. This is the first piece of cast-iron cookware I have ever owned. I purchased it when I was looking for a dutch oven for baking bread. This was the only one that I could find that was the appropriate size, and the fact that the lid is also a skillet was a big plus. I have since baked many loaves of bread in it and it has performed wonderfully. I also use the skillet for searing steaks before they go on the grill, and have been braising a lot of meals with it. Make sure that you clean it well and thoroughly dry it to prevent rust. This is one of the best multi-taskers I have ever owned and I am thrilled with it. Practical, flexible, and VERY reasonably priced. I bought this to try as an oven using only the heat from my range burner on the top of the stove. We had been without power for a week from an ice storm, and were able to cook stew over the fireplace, but not able to bake anything. I tried this yesterday by baking cornbread in a glass casserole pan that would fit inside the bottom part of the pan. I placed the glass dish on top of 3 metal canning lids in the bottom part of the Lodge pan and then placed the Lodge lid on top, with the lid handles not lining up exactly for easier lifting to check on while cooking. I preheated the lid and the bottom part of the pan on my stove burners while preparing the cornbread. I also have a small, 6" Lodge skillet that I preheated on the third burner. After putting the batter into the glass casserole dish and placing the lid on the bottom part, I put the hot 6" skillet on top of that for additional top heat. This is why I like the "no loop lid" top: a loop lid would not allow me to put extra heat on the top. After 11 minutes, with the setting on Medium, I had nearly perfect cornbread. It was slightly burned on the bottom, and could have been a bit more browned on the top. I will try it again today on a lower heat setting on the bottom, and try heating the top skillet again halfway through the cooking , or try coals in it while using in the fireplace for more top heat. I am really excited about trying this the NEXT time my power goes out, and I need to bake something over my fireplace grating. PS My fireplace is too small to use effectively the Lodge camp ovens that are on legs. I already tried that, without success. one of my very favourite!